Shopping for a mortgage? Google is now a licensed mortgage broker. 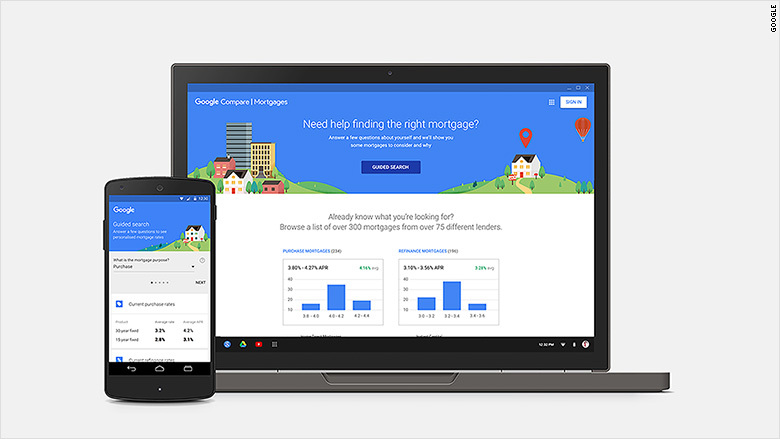 The tech giant launched Google Compare for mortgages on Monday that will allow potential home buyers to find and compare home loans. When looking to buy a home, experts recommend shopping around to find the best mortgage terms. With Google Compare, users will be able to enter personal information, including property value, down payment size and approximate credit score to get tailored results. The results will also show lenders' ratings and reviews. Homeowners can also use the tool to refinance their mortgages. The product is currently only available in California, but the company plans to expand into other states. Google is registered as a licensed mortgage broker. Though the company won't be financing mortgages, it will aggregate quotes from local and national lenders it has partnered with, including Zillow (Z) and Lending Tree (TREE), in order to help users find the best mortgage. Google (GOOG) acknowledged that lender participation is based on a flexible cost-per-lead model, which means the company is paid by the mortgage lenders. The mortgage comparison tool adds to Google Compare's offerings, which also allow users to shop around for car insurance quotes and credit card offers.